Welcome to the Torbay Lodge Guest House, ideally situated in the town centre of Dumfries. We offer 4 star bed and breakfast accommodation within our elegant and spacious Victorian town house. Modern benefits of free wireless internet access for your laptop and digital TV. For comfortable town centre bed and breakfast, come enjoy the accommodation in our home. 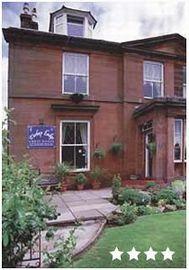 Our 4 star guest house offers the convenience of ample off-road parking and is ideally situated, being less than a five minute walk to Dumfries shopping centre. We are situated within the quiet conservation area of Dumfries town centre town and only 150 yards from the railway station (no train traffic can be heard within the guest house). Enjoy a traditional Scottish/English full cooked breakfast or choose from our varied alternative menu. All bed and breakfast accommodation rooms have colour TV, iron & ironing board, tea/coffee and hairdryers for your convenience. We are only 8 miles away from the ever popular wedding venue Comlongon Castle. Rates - all prices include breakfast. Single Occupancy (in double/twin en-suite): £38.00. Double en-suite: £56.00 per room. Twin en-suite: £56.00 per room. Family Room (1 double and 1 single bed): £68.00 per room. 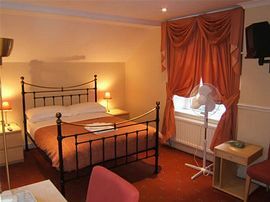 Family Room (1 double and 2 single beds): £78.00 per room.